Seems astronomers have found the largest diamond known to exist… Not deep in some mine on earth, but at the core of a star 50 light-years away (that’s 293,284,800,000,000 miles away if you’re interested… a relatively small distance). It’s really a pretty facinating story as we understand even more of the universe that God has created and we have the honor of living in. They named the star “Lucy” after the Beatles’ song Lucy in the Sky with Diamonds. You’ll find it in the Centaurus constellation. They value this diamond at 10 Billion trillion trillion carats, but sorry ladies… I don’t think you’ll be able to get this rock for an engagement ring… unless, of course, your finger is as large as the sun. BBC News has the full story. my finger would look SOOO GOOD! with that diamond on it. 1) Diamonds are not the hardest substance know to man. The are the hardest know natural substance. Big difference. 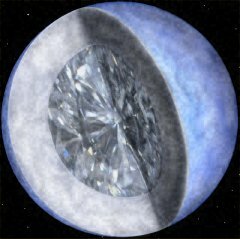 2)How does the diamond center of a planet have anything to do with the wonders of god? diamonds are just smushed carbon.